Innovation in renewable energy extends beyond solar and wind. 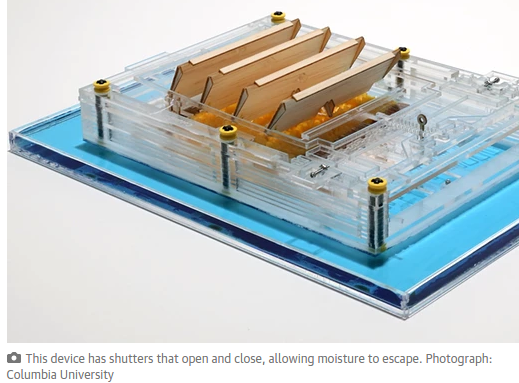 Researchers have found a way to use evaporation to generate electricity. They’re using bacteria and spores that expand and contract as they absorb water and release it. The effect is simple and subtle, but it has few moving parts (unlike wind turbines), and is simpler to build (unlike solar cells). The estimated costs are, therefore, much lower. There is a second advantage. One of the prime places to utilize such a device is where there is open water in dry environments; e.g. reservoirs and irrigation ditches. By covering such open water, the devices will generate power while also reducing evaporation making it particularly useful in places like the American Southwest.